Fish caught and cooked by a river….there’s nothing better. Bundaberg locals will tell you that the area has some of the best river fishing spots in Queensland, and we think these are too good to keep secret. Why not make it a weekend mini-break or week-long holiday and enjoy the best fishing the region has to offer? With an Almac aluminium boat trailer for your tinnie, you’ll have everything you need for a great weekend! With beautiful scenery, abundant wildlife, and clean water, Bundaberg’s rivers and creeks are teeming with fish, crabs, and other aquatic life. 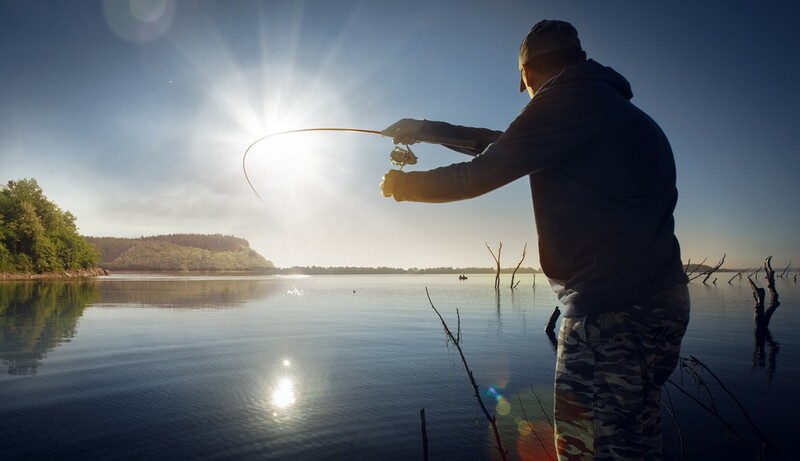 For the best Bundaberg river fishing spots, check out our picks below. The Burnett River still has plenty of great fishing and prawning left to be had in its tidal section. Dividing the city of Bundaberg in two, the Burnett has always been a prominent fishing spot for locals. It offers a smorgasbord of fish species, from whiting, bream and barramundi caught any time of year, to bream, tailor, and blue threadfin salmon in the colder months. Although the river can be fished from its mouth at Burnett Heads to Ben Anderson’s Barrage, the hotspots to watch out for include the North Wall, Skyringville, Strathdee’s Rocks, Kirby’s Wall, the Town Reach, and Splitter’s Creek. The river runs right through the centre of Bundaberg as well, so extending your stay is easy. A huge system encompassing the Gregory, Isis and the Cherwell rivers, The Burrum River offers great fishing and crabbing opportunities. Fish species commonly caught on the Burrum include bream, black bream, whiting, estuary cod and flathead. Mud crabs can be found all year long, while prawns, barramundi, and mangrove jack are seasonal. Finding the best spots are easy, with the main access point from the Bundaberg side at Walker’s Point via Woodgate, and the southern access point at Burrum Heads. To make your fishing getaway a memorable one, there are caravan parks and units at Woodgate and Burrum Heads, and popular camping grounds at North Shore in the Burrum Coast National Park. A camping permit for the National Park is required, and can be purchased at the National Parks website . There’s something for everyone at the Kolan River, which is very popular with local fishermen and those who love to go out in a boat or kayak. Prawns and mud crabs are found in abundance, as well as barramundi. Small mangrove-lined tributaries hide cod, mangrove jack, black bream and mud crabs, while wide, shallow sand flats offer whiting and flathead. Barramundi over the legal limit of 1.2 metres have also been taken on the Kolan – some of the biggest saltwater barra seen in the region! To access the river, the Booyan Ramp on the south is a good single lane ramp usable in all but low tide, while the Miara ramp on the north side can be used in any tide. As a result of the 2013 cyclone, the camping area at the Kolan River is now an island and is only accessible by boat. For more information camping in the area, check out the National Parks website . As always, you will need a permit. Baffle Creek – Fish Paradise! A relatively pristine system that is one of the last creeks in Queensland to have no dam attached, Baffle Creek offers beautiful surrounds and lots of wildlife. If you love fishing, canoeing or boating, the Baffle Creek system is a must see when you visit the region. At a whopping 35 kilometres long, the Baffle Creek system is bigger than any other estuary in Southeast Queensland, and the fishing is proof. From queenfish, tailor, trevally, salmon, bream, whiting, flathead, perch, cod, barramundi and more, Baffle Creek has it all. The hotspots to target for flathead, whiting, bream, flounder and sole include the large sand flats, while barramundi prefer the rocky areas down from the mouth of the river. For main access points into the creek, there are ramps at Boaga and Colonial Cove on the southern side, and Flat Rock on the northern side. For a great caravanning experience, check out the Baffle Creek Caravan Park . Pancake Creek and Middle Creek – Family Fishing at its Bundy Best! For years, Pancake Creek and Middle Creek have been popular destinations for anglers in the Bundaberg area and beyond. With the track into Middle Creek from Agnes Road, a once 3 to 4 hour drive has been shortened to an hour at worst, and it’s time you reaped the rewards. At Pancake Creek, expect great fishing, spear fishing, and snorkelling opportunities. With a small rock and coral reef at the mouth of the creek, your family will be endlessly enthralled with the aquatic life. Oyster-encrusted rocks are bream magnets, and you’re sure to catch anything from bream, tarwhine, and flathead. To access the creek, the ramp at Middle Creek is sand and rock and it is possible to launch a boat with a four-wheel drive at all but low tide. Higher tide is needed at Pancake Creek in order to make the trip safely, and care should be taken at all times to avoid shallow sand bars and rocks scattered along the creek bed. The best campsites on offer at Pancake Creek are on the eastern shore close to the mouth. Their advantage is a sandy beach, grassy, cleared campsites, and picnic tables, as well as picture perfect views. A permit is required to camp at either of these creeks. For more information, check out the National Parks website.